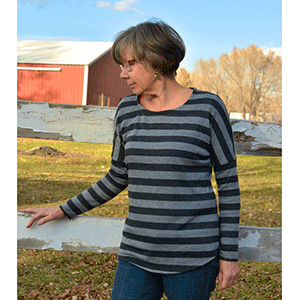 The Aurora Tee is a stylish, comfy knit top with a slouchy fit through the body and dolman sleeve, and a fitted extra-long lower sleeve. It features a curved shirt hem and the option for coordinating fabric insets on the sides. 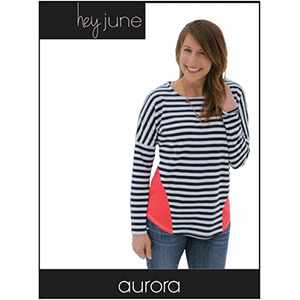 Pair your Aurora Tee with some leggings, a statement necklace, and ankle boots and you’re ready to go! Suggested fabrics are knits with at least 30% stretch such as french terry, ponte de roma, cotton jersey, cotton lycra or hacci. 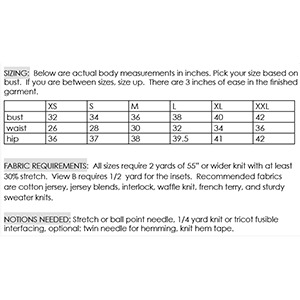 2 yards needed for all sizes.